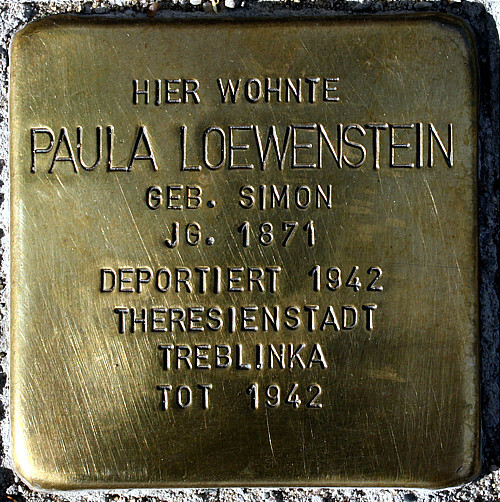 Paula Loewenstein, geb. Simon (1871 – 1942) was born in Neuenburg. She lived first on Fürstenwalder Straße 32, later at Wollenweberstraße 60. In 1942 she was deported to Theresienstadt und from there to the extermination camp at Treblinka. She was murdered there at the age of 71. Her name is immortalized on the wooden plaque in the Memorial to the Victims of Political Violence in Frankfurt (Oder).